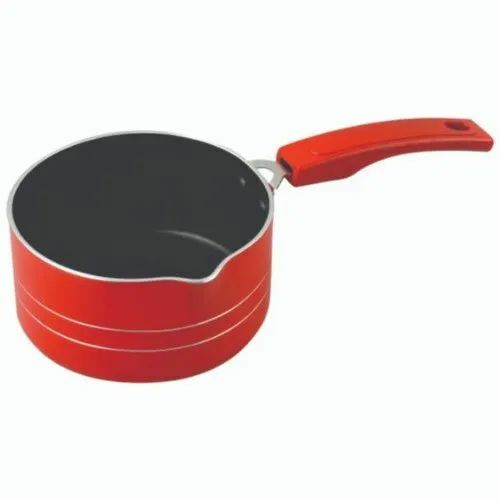 Prominent & Leading Manufacturer from New Delhi, we offer 1.5 Litre Non Stick Saucepan, Aluminium Pressure Cooker, Handi Pressure Cooker, 2 Litre Curved Pressure Cooker, 2 Litre Apple Pressure Cooker and Non Stick Cookware. Introducing Ae maharani Cookware with coating which makes you everyday diet a little healthier . With its extra thick durable body, the Ae maharani nonstick Cookware looks good and cooks even better . Add to that its spoon friendly and extremely durable body makes it perfect for every kitchen. Fostered with enormous business understanding of this realm, we are involved in presenting a broad consignment ofAluminium Pressure Cooker. So as to accomplish high level of customer trust, we are keenly involved in offering Handi Pressure Cooker We offer them at reasonable rates. Backed by a rich industrial experience, we are engaged in offering a commendable array of 2 Litre Curved Pressure Cooker. Having a definite quality management system, we are immersed in bringing forth a top class consignment of 2 Litre Apple Pressure Cooker.